Omphalopagus twins are a classification of conjoined twins. 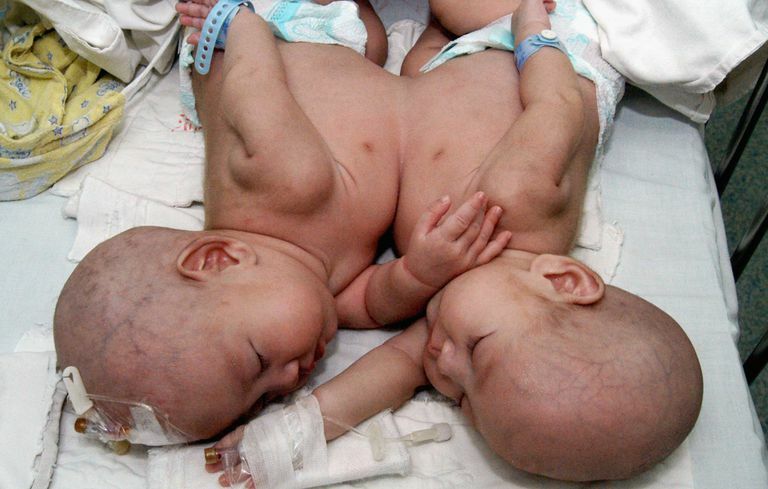 They are one of the most common types of conjoined twins, representing about one-third of conjoined twins. Conjoined twins are classified by the location of their connection. In the case of omphalopagus twins, they are connected at the abdominal region. These individuals share an anterior connection of the trunk, usually at the abdomen, but the connection can range from the thorax down to the umbilicus. Usually, omphalopagus face each other. There are four arms, four legs, and two pelvises. Omphalopagus twins may share a liver, gastrointestinal or genitourinary functions. Omphalopagus twins are differentiated from thoracopagus twins because they do not share a heart. They are differentiated by ischiopagus twins, who are also joined at the pelvis, based on the angle of the spine; ischiopagus twins have two separate spines forming a lateral angle smaller than 90°. Visual confirmation by ultrasound can identify conjoined twins and determine details about the location of the connection. When conjoined twins are suspected, magnetic resonance imaging (MRI) can provide a clearer picture of the situation. Other assessments, such as an echocardiogram may provide further information about how the twins are connected. In some cases, omphalopagus twins are not confirmed until after delivery. Tiesha and Iesha Turner: The Turner twins were born in Texas in 1991. They shared a sternum and liver. Their intestines were entwined. Although they had individual hearts, the organs were fused together. They were separated at Texas Children's Hospital in Houston, Texas on June 9, 1992. In a follow-up interview in 2007, the girls were reported to be healthy, normal high school students. Andrew and Alex Olson: These twin boys were born in South Dakota in 1987. They shared a liver and their intestines were entwined; each boy had an autonomous leg and shared a third. They underwent separation surgery at the University of Nebraska Medical Center in April 1988. Each boy lost a leg in the separation. "About Conjoined Twins," The Children's Hospital of Philadelphia. "Conjoined Twins Facts," University of Maryland Medical Center. Kantarcı, M., et al. "Omphalopagus conjoined twins: ultrafast MR imaging findings." Diagnostic and Interventional Radiology, December 2006. Pg. 187. Savage, S. "Local Conjoined Twins Separated Almost 16 Years Ago Talk About Their Lives Today." Sievers, K. "Identical, But Not Alike." Tongsong, T., et al. "Omphalopagus conjoined twins." Ultrasound in Obstetrics and Gynecology, 1999. Pg. 439.